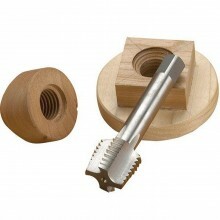 By simply taking a suitable block of fine-grained timber, pre-drilling a pilot hole and then using one of the precision spindle taps, it is possible to mount the timber block directly on the lathe spindle, securely, using the spindle thread itself – just as you would mount a faceplate or chuck. Once mounted on the spindle, the block can be turned into whatever shape is required to suit the workpiece and, being threaded to match the lathe spindle, the jig you create can be removed and re-fitted to the spindle as often as the job requires. In this way you can build up a complete ‘library’ of useful jam chucks, jigs and fixtures to increase your turning versatility, speeding and easing your workflow. Because the device is mounted on the spindle thread directly, concentricity and repeatability are assured for use time after time: gone is the frustration of trying to re-mount a block in a chuck whilst maintaining perfect alignment! For the tapping operation, the spindle is locked in position so that it cannot rotate. The tap is entered into the pre-drilled hole and the tailstock centre brought up to support the tap which carries a central indent for the purpose. The tap can now be rotated (using a spanner works best for most situations as the centre height of many lathes precludes the use of a conventional large tap wrench) and the tailstock quill advanced simultaneously to maintain centring. The tap is simply wound in to the timber until the required depth is reached – usually by allowing the tap to gently “bottom out” in the hole. At this stage the tap is released by turning it in reverse (anti-clockwise) until it is clear of the workpiece. The workpiece may now be released from the chuck and screwed directly onto the spindle ready for turning into the desired shape and size. Simplicity itself. A secure mounting, exactly concentric with the lathe spindle, precisely sized and shaped to suit your project - and at very little cost. Click the button below to add the Beall Spindle Tap 1 1/4 x8 for DvrXp and 1624 Lathes to your wish list.